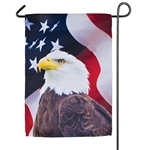 Show your patriotic side by choosing from our wide array of flags. Also check out coordinating mailbox covers, yard signs, windsocks,spinners, and floor mats. 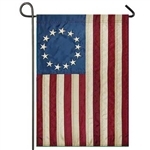 FIREWORKS AND FLAGS Garden Size Flag - 12" x 18"
PATRIOTIC STILL LIFE Garden Size Flag - 12" x 18"
SUMMER TRUCK Decorative Standard Size Flag - 28" x 40"
SUMMER TRUCK Decorative Garden Flag - 12" x 18"
FIREWORKS AND FLAGS Standard Size Flag - 28" x 40"
PATRIOTIC STILL LIFE Standard Size Flag - 28" x 40"
U.S. EAGLE Garden Flag - 12" x 18"
USA MASON JAR Decorative Flag - Garden 12" x 18"
Patriotic Truck Decorative Flag - Standard 28" x 40"
Patriotic Star Decorative Flag - Standard 28" x 40"
Always Remember Decorative Flag - Garden 12" x 18"
Farm, Family, Country Decorative Flag - Standard 28" x 40"
Vintage Truck Decorative Flag - Standard 28" x 40"
Patriotic Star Decorative Flag - Garden 12" x 18"
Patriotic Truck Decorative Flag - Garden 12" x 18"
Vintage Truck Decorative Flag - Garden 12" x 18"
Patriotic Flowers Decorative Flag - Standard 28" x 40"
Patriotic Flowers Decorative Flag - Garden 12" x 18"
Bluebird Salute Decorative Flag - Standard 28" x 40"
Bluebird Salute Decorative Flag - Garden 12" x 18"
Patriotic Porch Decorative Flag - Standard 28" x 40"
Patriotic Porch Decorative Flag - Garden 12" x 18"
Patriotic Watering Can Decorative Flag - Garden 12.5" x 18"
Born and Raised Decorative Garden Size Flag - 12" x 18"
Geraniums and Daisies Decorative Standard Flag - 28" x 40"
Geraniums and Daisies Decorative Garden Flag - 12" x 18"
Happy 4th Y'all Decorative Garden Flag - 12" x 18"
Betsy Ross Applique Standard Size Flag - 28" x 40"
Betsy Ross Applique Garden Size Flag - 12" x 18"